Richard Dennis is one of the legendary traders of the 1970s and 1980s. He was one of the two traders who trained the famous turtle traders. Dennis was interviewed by Jack Schwager for his book Market Wizards. His chapter is called A Legend Retires. Dennis began as a runner on the commodities exchange floor in the late 1960s. In 1970 he borrowed $1,600 from his family and bought a seat on the Mid America Exchange for $1,200, leaving $400 to trade with. This exchange – which trades smaller contracts than the major exchanges – was the only one where he could afford a seat. Since then he has been a commodities trader. Over time, Dennis turned that $400 into $200M. Let’s just say Richie ran that four hundred bucks up pretty good. – Richard Dennis’ father. Dennis has a low-spending lifestyle, but makes large political and charitable contributions. He is the founder of the Roosevelt Center for American Policy Studies, a liberal think tank, and supports higher taxes for the wealthy. He has also backed a lot of losing Democratic candidates for President. When he left trading (soon after the Schwager interview) he went full-time into politics. Dennis thinks that a lot of traders get “imprinted like ducks” by their first big trade. If their first big profit is on the long side, they become perennial bulls; if it’s on the short side they become perennial bears. Both sides have to be equally OK. There can’t be anything psychologically more satisfying about one than the other. Go with the trend, and the stronger the trend, the better. All the markets closed at their highs on a Friday, and Dennis bought a few mini-contracts in corn, wheat, and beans. On Monday they all opened limit up because of corn blight news. True to his imprinting theory, he finds Friday market closes a useful indication of the price action for the following week. His first big loss came in 1970, when he had built the $400 up to $3000. With three bad bets in a row, he lost one-third of his portfolio. He now thinks he should have got out after the first $300 loss. When you have a destabilizing loss, get out, go home, take a nap, do something, but put a little time between that and your next decision. When you are getting beat to death, get your head out of the mixer. But in retrospect, the loss was worth it to learn that trading rule. You have to minimize your losses and try to preserve capital for those few instances when you can make a lot in a very short period of time. Dennis made enough money in the 1973 soybean market – trading in and out – to move up to the Chicago Board of Trade the following year. This time he was scalping rather than trend following. So many people would make incredibly bad trades just to take a profit. They would get out even though the market was locked limit-up and almost sure to go up the next day. They couldn’t stand the profits burning a hole in their pocket. Dennis trades multiple markets, which helps him to avoid problems when one or more markets is trading sideways and making a lot of false breakouts. For him to have a bad year, they all have to be trading sideways. He had a bad year in 1978 when he made the transition from floor trader to off-the-floor trader. He learned that he had to be a longer-term trader when he was working from a desk. In the pit, you can get better prices, trade more quickly and sense what is going on. But he had to make the switch in order to trade multiple markets simultaneously. When started, there were no markets in currencies, interest rates or gold. But by 1978 there were, and Dennis wanted to trade them. Dennis is both a discretionary trader and a systems trader. And when his gut trading instinct conflicts with his systems, he does nothing until he can resolve that conflict. Since his systems are mostly trend following, this usually occurs at turning points in the market. He thinks that you need to have both an analytical approach and lots of real-world experience. He gives the example of an academic type developing a system that places stops where there will be lots of stops. In the real world, it is not too wise to have your stop where everyone else has their stop. He recommends that people keep a trading diary and analyse why they did things and which things worked out. The trading experience is so intense that there is a natural tendency to want to avoid thinking about it once the day is over. You should expect the unexpected in this business; expect the extreme. Don’t think in terms of boundaries that limit what the market might do. When he develops a system, he often doesn’t trade the version of the system that performed best on past data, because he might think that the future is going to be unlike the past in a specific way. He will test the tweaked system on past data, but if the “loss” is only 10%, he will probably use the tweaked version. He gets out of positions that are losing – or even close to breakeven – after a week or two. He also has a “maximum risk point”, the equivalent of a mental stop-loss. He thinks that the main thing about trading is to make sure than however you define a trend, your system should get you into a major trend. When you’re on a losing streak, cut back trading size. If things get really bad, stop for at least a day or two. You have to make your own trading decisions, and not worry about what other people are doing. He thinks that all markets are the same, and he could trade from price data without knowing the name of the market. If a system doesn’t work for multiple markets, he isn’t interested in it. The only market that is different from the rest is the stock market. The stock market doesn’t trend as much and for individual stocks price movements are almost random. Dennis thinks that this is because there isn’t enough fundamental information per stock to create trends. There’s also a lot more technical information, though Dennis doesn’t think this is as important. With only a few commodities, there’s lots of fundamental information on each. And technically, you only have price, volume and open interest. Dennis wouldn’t provide Schwager with many details about his then current approach, but it involved trading either short-term or long-term. It is the intermediate term that picks up the vast majority of trend followers. The best strategy is to avoid the middle like the plague. In 1984, Dennis famously started – with a friend1 – the Turtle Traders programme, where he took in novices and taught them how to trade. The idea was to settle their argument about whether trading skills could be taught using a set of rules. It’s frightening how well it worked. Dennis doesn’t think that anyone can be a trader. He whittled 1,000 applications down to forty interviews and then hired ten. He wouldn’t explain what he looked for in case he wanted to do it again. He wasn’t worried about revealing his trading strategies because he doesn’t think that people knowing about them will stop them working. You could publish trading rules in the newspaper and no one would follow them. The key is consistency and discipline. He thinks that the experiment was successful because he gave the trainees the confidence to stick to the rules when things were going badly. The training took only two weeks in the first year, and one week in the second year. Three people were dropped from a total intake of 23. The remaining twenty averaged 100% profit per year. They started with $100K and by the time of the interview they were managing $2M each. Dennis thinks that luck plays no part in trading, over the long run. Trading to me is like betting on independent rolls of the dice that you think are loaded a little bit in your favor, because you know some statistical things about the market. If something has a 53% chance of working each time, over the long run there is a 100 percent chance of it working. But on an individual trade, it is almost all luck. He has long-term views about macroeconomic issues, but doesn’t use them in trading. He worries that rigid views about the future will cause you to miss a profit opportunity. Taking these opportunities is the second-most important thing (after cutting your losses short). Dennis estimates that 95% of his profits have come from only 5% of his trades. 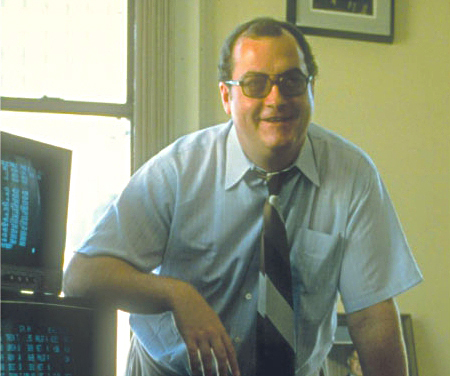 At the time he was interviewed by Schwager (1988) Dennis had lost 50% in the previous year – which included the October 1987 crash. This led him to cease trading in his public fund, which at the time was worth $120M. Dennis initially thought that running money for other people was a good deal: potential return with no risk. After his public funds lost 50% and closed, he changed his mind, citing the psychological cost of being a money manager. One of his biggest losses during the 1987 crash was in the interest rate markets, when the market opened six times higher than his stops (he was short). Despite this 50% loss in the final year, each $1,000 invested when the fund opened would have returned $3,833, for a 25% annual compounded return. About 10 percent of the money I had made in the markets. Of course, measured as a percentage of my net worth, the figure is much higher because of my charitable and political contributions over the years. Schwager says that you wouldn’t have been able to tell by his mood and confidence that he’d just had a big loss. A month after the interview, Dennis announced that he was retiring from trading. Dennis thinks that trend-following had become much harder from 1970 to 1988. There are lots more false breakouts, perhaps because there are more computer-based trend followers. He sees this as a “perverse” victory for technical trading – perverse because it reduces the value of technical trading. He thinks that simple trend-following systems will stop working one day, and it will be harder to develop a system that works. You just have to be one step ahead of everyone else. Trading needs to be unemotional – even after losing $50M of other people’s money, he remained unemotional. The flip side is that you can’t feel too good when things are going your way. It is misleading to focus on short-term results. There is more to life than trading. Everyone has shock absorbers that deteriorate over time. Being a trader is like being a boxer: Every now and then, the market gives you a good wallop. After twenty years you get a bit punch-drunk. Richard Dennis is a legend of trading, but despite all the information above, the interview is somewhat disappointing. Cut your losses and preserve your capital for the big winners – 95% of the money comes from 5% of the trades. Make sure that your system gets you into a major trend. Discipline matters more than trading rules. Avoid being a perennial bull or perennial bear – both sides have to be equally okay. When your systems conflict with your gut instinct, do nothing. When things go wrong, cut back your trading size, and if necessary, take a break from the markets. Make your own trading decisions – as unemotionally as possible – and don’t worry about what other people are doing. Keep a trading diary and try to work out what went well and why. Trading multiple markets helps when some are moving sideways with lots of false breakouts. All markets are the same apart from stocks (fewer trends). Don’t optimise your trading system for past data. Trading can be taught (witness the Turtles).